As Europe’s largest dental care provider, we can offer you a truly outstanding and unique development scheme. Our one-of-a-kind programme offers qualified dentists, who lack recent work experience, a well-supported and well-structured entry point to UK dentistry. You’ll benefit from top-tier training and enjoy state-of-the-art facilities. Plus, you’ll develop the knowlege and confidence you need to take your career to the next level. You’ll start your development at this internationally renowned faculty, where outstanding resources and expert teaching combine to enable you to become a confident multidisciplinary clinician. Current concepts of managing patient care including restorative, prosthetics, endodontics, paedodontics, oral surgery and periodontics. You’ll be welcomed into our prestigious Academy in Manchester where, over two days, you’ll learn all about the systems, processes, support and procedures you’ll need to understand in order to confidently operate in general practice. You’ll receive weekly tutorials, as well as ongoing and informal clinical support and advice. This personalised and supportive learning experience will enable you to develop your career as a competent, caring, reflective practitioner, in any branch of dentistry. Current concepts of managing patient care including restorative, prostheitcs, endodontics, paedodontics, oral surgery and periodontics. You’ll be welcomed in our prestigious Academy in Manchester where, over two days, you’ll learn all about the systems, processes, support and procedures you’ll need to understand in order to confidently operate in general practice. If you’ve less than a year’s experience in general practice or have gained limited clinical experience over the last four years, this is the perfect scheme for you. The sky is now the limit for you. Once you’ve completed the PDS you’ll be ready to start your career as a private dentist, providing treatment to patients on our affordable private dental scheme. 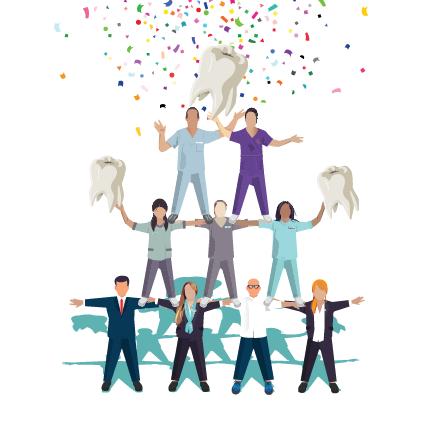 From here you can explore opportunities to become an NHS dentist and continue to develop and build your skills in general dentistry, while accessing all the support and training opportunities available to you as part of the hugely talented mydentist familiy.